State of South Australia marked 10 years of HiAP practice in 2017. 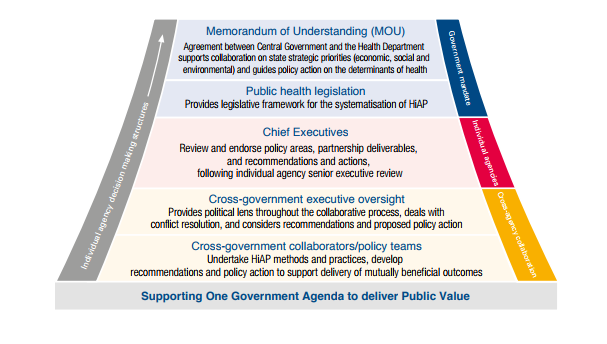 Key drivers for such long history of HiAP have been following: central government directive and mandate; social determinants of health – as entry point; public policy focus – not health priority; leveraging existing government decision making structures; collaboration and partnership; co design process and evidence. Vision: Public policy creates the social, economic and environmental conditions to promote population health, well-being and equity. Aim: Improve the health and well-being of South Australians by strengthening cross-government action on the social determinants of health through a Health in All Policies approach. Challenges South Australia is facing in practising HiAP are: continuing and emerging complex policy issues; constricted economic climate; culture and structures of Government department; political cycles; skills and capacity of workforce; processes and tools: and time to establish trust. To access the case study on South Australia’s Health in All Policies Experience click here.